I was a theater / band geek growing up. I graduated as an honor thespian as well. I'm passing my love for the arts on to my kids as well! Netflix recently came out with a new show that introduces children to all kinds of arts like writing, costume design, acting, and lots more. Julie’s Greenroom is an all-new arts educational show for young children starring the legendary Julie Andrews and brought to life by the ingenious minds at Jim Henson Studios. Join Fizz, Riley, Peri, Spike, and Hank, as they explore the magic of the performing arts under the mentorship and teaching of theater legend Julie Andrews. Together, Ms. Julie and her assistant Gus team up with some very special guests (Idina Menzel, Alec Baldwin, David Hyde Pierce to name a few) to help the Greenies learn about the creative workings of each different performing art (dance, singing, performing, painting, and more). Follow along as the Greenies master each talent, learning and working together en route to their final dramatic performance! It doesn’t matter who you are or what you look like: Ms. Julie and friends want to show you how the theater is for everyone. While this show is aimed at small children, my 9-year-old binge watched it because she loves all things arts. She just discovered the amazing Julie Andrews in Mary Poppins and when she realized they were the same person she was very excited. Since watching the show she has expressed her desire to become a songwriter. I love it! 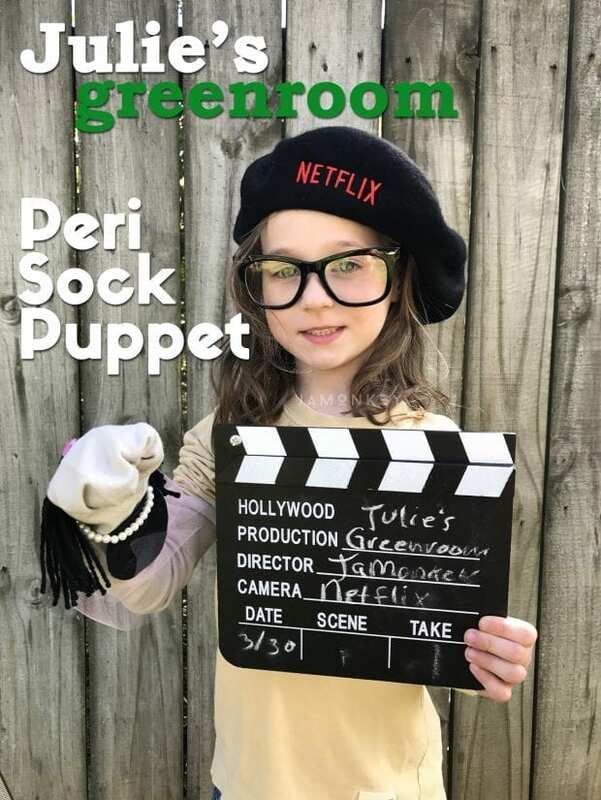 Check out the video we created to make this cute Peri Sock Puppet! This is an easy craft you can make with your kids to demonstrate the art of making something functional like a puppet and also put on their own show with the sock puppets that they made! Black felt Make sure you leave some space for the mouth to be tucked in and position your eyes where they need to be. To make the yarn look like hair, wind it around your four fingers a couple times. Then use another piece of yarn to tie them all together. Cut the loops so that it looks like hair. Glue everything onto your sock and let it dry. Have fun making a cute puppet show! I am a member of the Netflix Stream Team.